Cheese To The Rescue: Surprising Spray Melts Road Ice : The Two-Way Citing definite gains in cost and efficiency, a Wisconsin county used 38,000 gallons of liquid cheese brine on its icy roads last winter. The homegrown product is a "win-win" for a nearby dairy and the county, a transportation official says. In Wisconsin, a dairy that makes mozzarella and provolone cheeses is giving its leftover salt brine to counties that use it to help melt road ice. 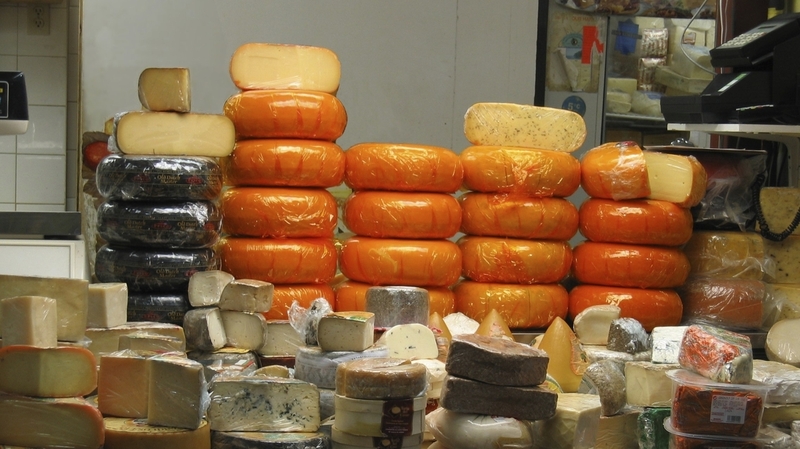 Here, wheels of cheese are stacked in a deli. This winter, a Wisconsin county is fighting icy roads with a homegrown product: liquid cheese brine. Tens of thousands of gallons of the stuff are used each year along with road salt, according to officials in Polk County. The rural county (county seat: Balsam Lake) uses the cheese brine in "pre-wetting for snow and ice control," as Emil "Moe" Norby, technical support manager for the Polk County Highway Department, tells us. And he says the brine has a definite effect when it's mixed with regular road salt. "It seems to make it go down to a lower freeze point," Norby says of the salt and cheese brine mixture, citing "better results at colder temperatures." "During the winter I placed a 12-ounce container of the salt brine outside and found it did not freeze until we had two consecutive days of 21 degrees below zero," Norby wrote in an early appraisal. There are other benefits, according to a study Norby conducted on test roads a few years ago. First, the brine helps salt stick to the roadway rather than bounce off. Second, it was found to speed melting. And its overall efficiency means the county uses less salt — and saves thousands of dollars. "Depending on the amount of material being applied, the [salt] saved was 30 percent to 40 percent," according to the study's conclusion. The findings from those tests, conducted in the 2008-2009 winter, led the county to use cheese brine more widely. If there's a drawback to the cheese brine, it may be the smell. "It has a slight odor when you handle the product," Norby says. "If you were behind a snow plow, you'd immediately smelly it." But that's a temporary issue, he says. And if you're wondering if the cheese brine rinses away clean along with the snow and ice – or leaves a sort of washed-rind cheese sheen on the roads — Norby says that hasn't been a problem, either. "We found no residue or problems," he says. "It's worked very well for us." Emily Norby/Polk County Highway Dept. A salt truck is outfitted with side tanks that spray liquid cheese brine on the roads of Polk County, Wisconsin. 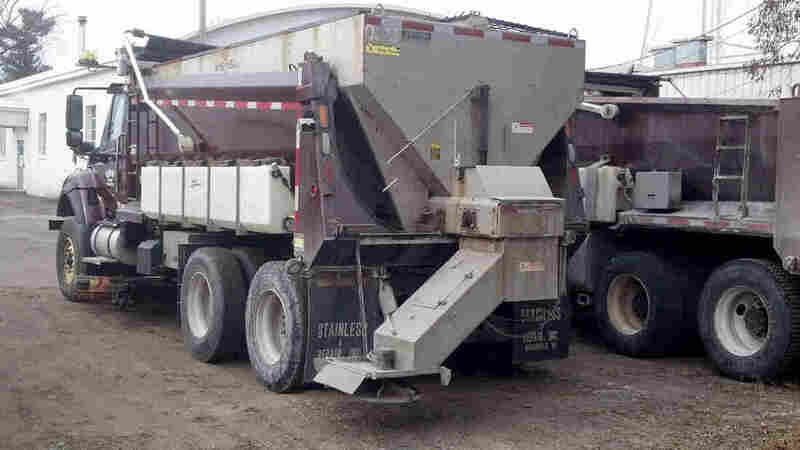 Highway officials say the approach is more effective than using salt alone and reduces waste. Other towns and counties are taking notice. Milwaukee is trying the brine out this year, and the approach has attracted media interest outside the state, as well. "It's piqued a lot of interest," Norby says. Norby says that using the cheese brine – a byproduct from a nearby dairy – is a "win-win" for everyone involved: the brine makes a definite difference for the county and its drivers, and the supplier, F&A Dairy, whose other products include mozzarella and provolone, doesn't have to pay to have the brine removed as a waste product. And Polk County is using it by the tankful – at least 150,000 gallons in recent years. "Last winter, we put down 38,000 gallons of it," Norby says. They'll likely need as least that much this winter, which has sent large storms barreling through swaths of the U.S., disrupting traffic with sheets of ice and coats of snow. As Mark reported for the Two-Way earlier, today's headline is "Old Man Winter to drop bombogenesis" — a catchy name for the volatile weather system that's currently hitting areas of the eastern U.S.